Posted March 13, 2014 by Emmet Farrell in Features. 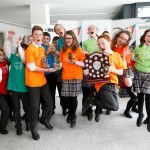 Coláiste Bhaile Chláir is the February winner of the All-Ireland Secondary Schools Challenge Cup on mathletes.ie. 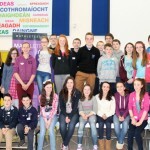 MATHletes Challenge 2014 is a maths tournament for Ireland based on the Khan Academy approach to learning and teaching maths. Students compete online through the Khan Academy website. Students in the Schools Challenge can work on Khan Academy both during class time and at home after school. Teachers can assign practice problems, videos, and mastery challenges that best fit the needs of their students and students can work at their own pace. The following students are listed in the Students Challenge Leaders in First year in Ireland: Roy Grealish, Emily Sheeran, Medeina Macenaite, Leanna Callannan, Fynn Duclaux. Minister of State Ciaran Cannon will visit Coláiste Bhaile Chláir to present the cup on Friday 14th of March. 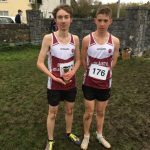 Congratulations to the 13 athletes who qualified from a tough field in the South-Connacht Finals and represented Coláiste Bhaile Chláir in Sligo at the Connacht Cross country finals they achieved excellent results. 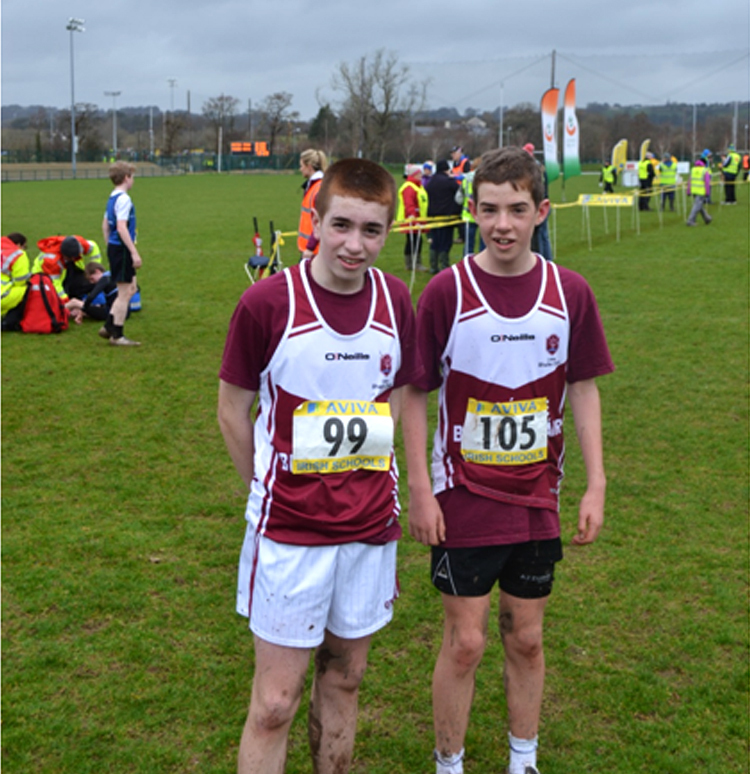 Darren Costello and Aaron Brennan (pictured above) represented the school in the All-Irelands in Cork IT on Saturday the 8th of March. 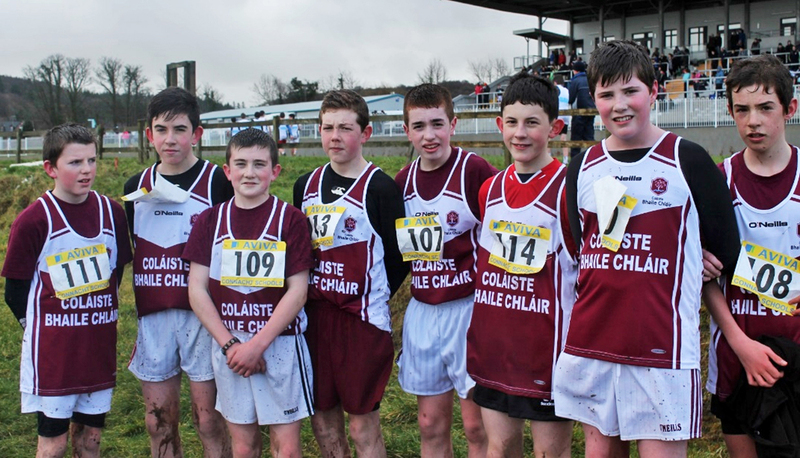 It was a huge achievement to reach the All-Irelands at their first attempt, well done. Six students from Coláiste Bhaile Chláir have made it through to present their project to a panel of judges at the Connaught ECO-Den on March 25th in the Claregalway hotel, Galway. Their project involved the development and presentation of a peer environmental education programme and a game programmed using Scratch. This is an initiative open to young people (aged 10–18) from all over Ireland which recognises and rewards young peoples’ efforts for carrying out environmental action projects. Raising environmental awareness not only in their communities but also amongst their peers in schools and local clubs is a huge factor in many of the YEA projects that are carried out. Best of Luck to Luke Adams, Saoirse McCarthy, Áilidh Molloy, Amy O’ Connell, Órlaith Roe and Jade Sweeney in the dragons den. Go n-eirí libh. Coláiste Bhaile Chláir took part in their first inter-schools show jumping competition at the weekend. The team of was made up of Áilidh Molloy, Niamh Moran, Rebecca Cormican and Chloe Hession. 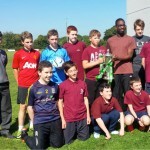 They gained valuable experience into the competitive scene and did their school proud. We look forward to lots of success and enjoyment in the future. Coláiste Bhaile Chláir student Christian Cotter had a great day out in Dublin at the start of March to celebrate his win in the MathsEyes project. 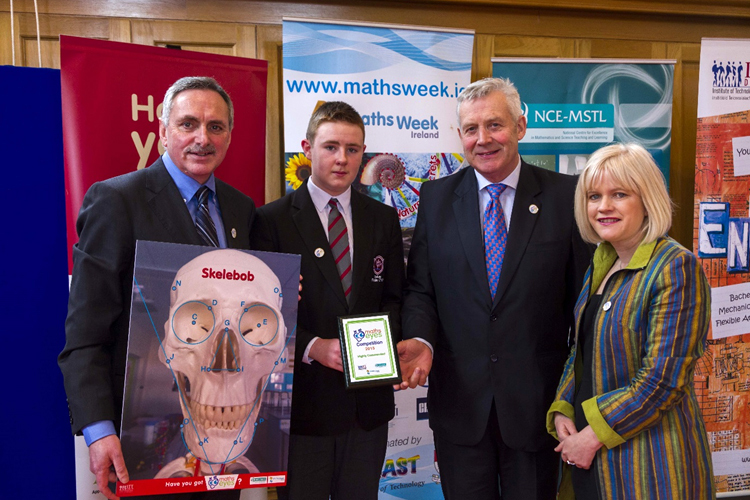 His poster entitled Skelebob was highly commended in the U14 category, a category with only 6 finalists from the National entries. The MathsEyes initiative is in its second year and is run in conjunction with UL and IT Tallaght during Maths Week. It encourages students to take a picture of something ordinary and highlight the maths in it. The Coláiste Bhaile Chláir students took part in the project during STEM lessons this year where they took photos of objects in the school and highlighted the maths they saw using software on their netbooks. Christian expertly imported his photo into Geogebra, a free maths and graphics software used in maths teaching, and highlighted some geometric shapes he identified in the face of the classroom skeleton Skelebob. This is a great achievement for Christian who has shown himself to have real skill in IT programming and manipulation. His win is a great acknowledgement of his ability and he already has his sights set on a future in computing with programming computer games high on his list of possible careers!